Ditching desktops for portables: The way forward? Opinion - Martin Hansen's article Maudlin over RISC OS reminded me of how I became a RISC OS user all those years ago. Unfortunately, it made me think about what made me abandon the platform a couple of years ago too. My last RISC OS computer was an A9home, and, putting its little quirks aside, what made me stop using it and finally put my usage of RISC OS to an end, was quite simply that I could not do anything that I wanted to do using it. I could list at length all the things that it could not do, but that's not the point of this article. My goal in this piece is to outline why pushing RISC OS on the desktop computer is largely a waste of time, and why there can be a far brighter future ahead if we simply think about alternatives to the desktop and laptop arenas. Put simply, RISC OS is totally outclassed on the desktop in every way that matters. Yes, RISC OS has some great user-interface ideas which make it fun and easy to use, but these are dwarfed by its failings. My view is this: if you pulled 100 people off the street, sat them in front of an Iyonix, and then in front of a Mac for half the price, and asked them which they would rather own, I'd concur that around 100 of them would want the Apple computer. Why? Because the Mac can actually do what they want: they can watch movies on YouTube, poke their friends on Facebook, sync their iPod, and do it all using a glossy friendly interface, running on a very pretty computer. Assuming the above is roughly correct, we can all agree that RISC OS's future on desktop computers is looking limited, particularly as Castle has yet to publicly commit to producing an Iyonix successor, and AdvantageSix is probably going to want to complete the A9home product before even considering making an upgrade. So, what's the alternative if we cannot compete against modern desktop computers? We compete against something else, and I propose that this should be Windows CE and embedded Linux. And below I outline why. Windows CE devices are ARM based, we can run RISC OS on these natively, and not produce new hardware. Users have far lower demands of these sorts of devices, so RISC OS's lack of a good JVM, Flash player, iPod synchronization etc. can be overlooked. Windows CE is not highly regarded, and RISC OS can compete fairly and squarely on merit, and not with apologetic cries of "but it has a great UI." RISC OS is plainly better than Windows CE, and that's a position against its competitors RISC OS has not been in for a long time. We get modern, native, small, laptops. Maybe even the talked about Celio RedFly. Now clearly RISC OS is not going to port itself to one of these devices, but I'd warrant that we have the skilled people in the community who would be technically able to do so. I'd also contend that those skilled enough to be able to take on the challenge of porting RISC OS to one of these devices is unlikely to want to do the work for free, so I'd like to propose the setting up of a bounty scheme. That is, those of us interested in seeing RISC OS ported to a portable ARM-powered device put our money where our mouths are and donate money into the project. The money would only be collected and paid on successful completion of the project. So if we take the hypothetical example that RISC OS Open takes up the challenge and decides to port RISC OS to the Nokia N810, we would first negotiate what would be required for successful completion. For example, in the case of the Nokia N810, we'd say that it's required that the screen, keyboard, pointer, sound, memory cards and wifi all work, but we could also say that support for bluetooth is not required. Whether the bounty hunter makes the port free, or charges for it (under Castle's licence) is neither here nor there to me. However, I'd suggest that to give the porter an ongoing income is a good way to get ongoing improvements. For example, in the future support for the webcam could be added in a paid-for update. I do believe that this plan represents a decent path forward for RISC OS. I don't suggest that everyone with an Iyonix or other desktop RISC OS machine should throw them away as they'll make great development workstations for smaller devices. I do however firmly believe that this is the only realistic path to grow the RISC OS user base and stop it dwindling from thousands to hundreds, and finally to nothing. Who runs the bounty is unimportant but it should be a trustworthy and respected figure in the community, maybe one of the many individuals who are well known in the RISC OS scene. It should also be someone with a facilities to host a website and show running total of the current bounty. If a bounty is set up, I'll be the first to donate, so what do we think? Do you agree with Garry? Is this the way forward for RISC OS? Get involved in the debate, and email your opinions or post a message below. "RISC OS would be a cool distraction on such a device but it'd be useless for getting any real work done, and you'd lose so many of the features and gain very little. The expectations of a mobile device already exceed what RISC OS can do." Now, I think the war is on in the Mobile OS arena. There is no market leader yet and it's growing very fast. Indeed, Windows Mobile is crap. But it's Microsoft and we all know they're not backing down until they own 80% or more. In my opinion Apple's iPhone and iPod touch devices have raised the bar significantly regarding interface design and usability on mobile devices. With the official release of a SDK for these devices next month, they're going to sell like hot cakes. In the US, the iPhone already has a larger marketshare than Windows Mobile and it's not even been out for a year there. To a certain extent I agree with the others ... in asmuch as currently to get the best I need RISC OS and Windows (or Linux or MacOS). For a small device to be considered with RISC OS to start with the main app missing is a browser you can really use - despite all progress of NetSurf and Phoenix both are way behind and the FF2 port of Chocky is useless (too long load time, much too slow, ...). Furthermore such a small device needs good connectivity - WLAN with up to date encryption to start with. True, as an OS RISC OS would probably be a very good choice for the small ARM powered gadgets, especially since it is an OS natively made for ARM and for use in ROM and not ported and thus probably more efficient. But as Jaffa and hEgelia outlined: The time when it was enough that the gadgets work nicely is past - they have to do a job and the apps needed for that are still amiss. But if someone would write just those missing apps, well then the RISC OS desktop computers would benefit too. I think that RISC OS can be successfull on the mobile device market. I mean: We do not need to beat windows. If we would reach 1% of the market than this would be really a great success. RISC OS has the advantage that it is a full desktop OS that could run on a mobile device. So you can have a full featured text processor. I have a Windows CE Samrtphone with 500 MHz ARM processor - and I like it because it is much better than any phone I had before. But e.g. the Word version that comes with it is rather limited. On this phone it doesn't matter because you do not have a keyboard anyway. But there are mobile devices with keyboards where you would see that Pocket Word is very limited. I understand that RISC OS can not be used on a phone because it is no real time OS but I think on mobile devices we would have a chance. Look at the EeePC to see that a mobile device does not neet to run RISC OS to be successfull. Anyway, I think that we will probably not see a native RISC OS computer after Iyonix / A9home. I hope we will but we should get used to the idea that there will be no native hardware in development. But: There are some ARM computer produced, as mobile devices as well as desktop computers (most embedded but comparable to the A9 I would say). So anyway it would be good to establish a way to port RISC OS to existing ARM devices. Sometimes you have the problem that the hardware is not dokumented but if I think about the Android platform comming up (the Google phone platform) then this might be a chance. AFAIK the platform is based on Linux which would it make possible to have a look at the drivers for the hardware. The article says much that is true, and I agree with Jaffa's hobby assertion. 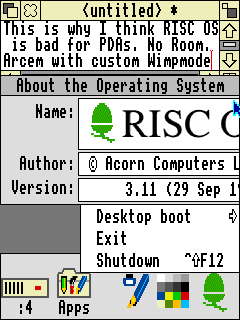 However, I'd much sooner use Windows CE/PocketPC on a PDA or phone than RISC OS: the GUI is *far* superior for tiny screens - something flibble once elegantly pointed out using ArcEm once. I was impressed when a friend let me test drive one of these Nokia devices - It was cool to see that drobe was still perfectly readable on such a small screen. It did seem slightly "Toy" like to me but he was thrilled with it. If, like me, you are struggling to understand these devices, there is a neat review of the Nokia N770 internet tablet on the Iconbar. Richard Goodwin shelled out £90 for one on ebay and seems pretty chuffed with it. From any consumer computing device I purchase today I expect a good internet experience and support of the most common audio and video formats. Without those, though, a snazzy new mobile device wouldn't really benefit me that greatly. I'd still buy one and use it a lot, but then I'm a stubborn RO addict that'll waste thousands regardless. For mobile devices no one cares about the OS, its all about the applications: phone functionaility, web browsers, music player and sat nav. Whilst Windows Mobile 6 and Pocket IE is the worst experiance imaginable, put Opera on the device and run it full screen, and it no longer matters whats underneath. For phone functionility Nokia has it swen up, and for music players no one looks like denting Apple's dominance. If we ported RISC OS to an ARM based web tabet or ultra portable sub note book, it would probably only be existing RISC OS users that would buy it, and there just aren't enough of anymore to make it worthwhile. I agree with Druck. It is all about applications and productivity today. With mobile devices like the vyenote I nought recently I get the best of both worlds, would I want it. I can use Vista business edition and have VirtualAcorn for the things RISC OS is good for. Its no good just porting the OS to something unless we have a clear idea on what it will be used for and vibrant software market to provide suitable applications for it. Otherwise you have an iconbar on the bottom, a cog on the corner, and the question on what on earth do you do with it now? Devices such as UMPCs which try to be full desktops in a vastly smaller form factors just don't work. Its very frustrating coming from the same application on a fast desktop (or laptop) to using it on much slower device, cram on to a tiny screen, and needing the dexterity of a brain surgeon to use the touch screen or minature keyboard. If you want desktop style working you either need a large laptop for use on the move, or an A9 which you can plug in to a full sized screen and keyboard when you get to where you are going. What works far better are applications targetted at the types of things you need the device for, and use way of achieving it matched to the smaller device. Whilst the spec's of Apple's iPhone are poor compared to most other smartphones, the applications and easy of use have set new goals for everyone. Compare the experiance of rubbing a couple of fingers over the iPhone's screen to do things, to having to use a fiddly stylus on a Windows UMPC. So just what RISC OS applications would you use on a small form factor device? Our best apps such as Artworks, Photodesk, TechWriter, Ovation Etc, aren't the sort of things you'll use with a tiny screen. You'll definately want a web browser but we haven't got one of the capability of Opera on the desktop, never mind the additional features of the mobile version to work well with small screens. Were also is the ability to synchronise email, calendar entries, and to do lists with a desktop? If we still had a huge pool of software writers willing to creare innovative applications to exploit new devices, then it would be worthwhile. But its obvious from the desktop market these people aren't around anymore, and its unlikely to interest them enough to come back. I'd like to be more positive, but I can't. We've all too old, been kicked when down too many times, and here is just not where things are at anymore. rjek: "The issue for software, of course, is not money. It's developer time." From what I've heard, the usual reason developers don't have time is because they work full-time jobs which aren't in the RO world. The question I put to developers is: If the community could raise enough cash, would you be willing to work full time on a project? Or in a paid part-time capacity? An organisation like RISC OS Connect would be ideal to set up such a scheme. But it needs donations and willing programmers to work. arenaman: "A bounty, or donations scheme, is hardly incentive. Making profit is." I doubt any sane businessman would invest in RO for the consumer market. Developing a competitive product is very capital intensive for relatively little gain. I'm sure I read once that ROL have never made a profit. Any new venture is likely to lose a lot of money before it makes any - there's just so much work to be done. IMO the only hope for RISC OS on the desktop is an open-source, non-profit model, powered by individuals that realise there's no profit to be made, but actually care about keeping the platform alive. Where is RISC OS Connect/Future? Everybody was an expert when there was a logo to be made but as soon as something tangible has to be organised it dies. Didn't people offer their money? As Druck says nobody will program money or not. I must admit I don't see how moving to small form factor devices is going to necessarily "fix" the issue. The issue that afflics RISC OS is one that affects *all* platforms other than Windows. Many of the things we *can't* do are either down to lack of information on (or sufficient money to license) proprietary technology and/or lack of developer time (or just plain insuffient numbers of developers) to port these technologies. This issue will loom large for other platforms too (e.g., Linux and to a lesser extent MacOS) and will probably be the major reason for most users sticking with Windows rather than moving to Linux/MacOS. Not being able to do things - or even having to wait years for a reasonable faximile of a Windows app on open source will put most people off. And if RO were to depend on Linux sourced GPL equivalents of common apps to port over then we'd be waiting longer still. Anyway ROL proposed a portable device version of RISC OS (RON) and as nothing came of that I'd suggest it would be hardly likely to happen now (I can't see Castle plumping for it and Ad6 probably have their hands full with the A9). Timephoenix wrote>"IMO the only hope for RISC OS on the desktop is an open-source, non-profit model, powered by individuals that realise there's no profit to be made, but actually care about keeping the platform alive." Trouble is to have even a remote hope to port technology that people want *will* cost money - unless these enthusiasts are rich we're not going to go anywhere (hey keep buying lottery tickets guys!!!). Acorn, AFAIK, paid half a million for their Java license (and that in 1990's money). So in reality making profit (or at least having the userbase cover the cost) would be necessary. rjek: "However, I'd much sooner use Windows CE/PocketPC on a PDA or phone than RISC OS: the GUI is far superior for tiny screens - something flibble once elegantly pointed out using ArcEm once." I believe this is the picture. A simple demonstration that the current WIMP design doesn't scale down to common PDA resolutions of 240x320 or lower. Just to clarify some points about my article: I don't suggest for a second that RISC OS has a suitable UI for PDAs, and the devices which I suggested all have decent sized screens, probably better resolution than you'd run a RiscPC without VRAM, or an A7000. Druck makes a very valid point about the lack of a vibrant software market, he's of course correct, but I think it's easier to make a vibrant market on these kinds of devices than on the desktop, simply because it's much easier to write the kind of app people run on ultra-portables (email,calendar,simple word processor, IM) than the type of app people run on desktops (Big Office packages, advanced drawing, photoshop). The basic sentiment of the article is that I'd never buy a RISC OS desktop, unless I had abundant amounts of money, purely for a "fun" machine. However, I'd certainly buy an Ultraportable RISC OS machine, because the kinds of things I do "on the road" are simple, RISC OS is very, very up to the job, and an ARM portable would provide tangible benefits over dragging my MacBook around, such as weight, battery life, durability (no moving parts means fewer breaking parts), and the fact that some of these ARM devices are less than £400, my MacBook was £1100, so I'm wary about taking it with me sometimes. It's not a cure-all solution, not by any means, but I think it raises RISC OS's chances of survival a little above zero, so it's worth considering at least. Garry puts forward good reasons why not to buy a desktop RISC OS system: I'm pretty certain my Iyonix will be my last one. But I think he is actually making a better case for using VRPC than for porting RISC OS to a PDA. I'm quite certain that my next desktop computer will be an iMac. I already have a copy of VRPC running on my old iMac and it is a very pleasant way of using RISC OS. And when I want to do something that RISC OS isn't good at I can switch to MAC OS on the same computer. My main uses for a PDA are word processing, spreadsheet, and MP3. I admit, I would like to have Techwriter/Easiwriter on my PDA, but the spreadsheet on my Palm PDA is better than anything available on RISC OS. And I don't believe a RISC OS MP3 player is going to be any better than the one on my Palm. The latest generation of Palms also do Sat-Nav. I just can't see how RISC OS can compete in this market. I also think it would be too late... but if it does happen it there is always the chance it could bring some new development. Trouble is:- I run a Sigmarion 3. It uses CE .Net 4.1 (not WM or PPC). the interface is just like a windows front end with touch screen. To give a rundown on hardware. CPU - Xscale 400Mhz (will overclock to 530Mhz), 64Mb ram, 32Mb rom, 800x480 5" TFT, 8Mb Ati Imageon 4200 grfx chip, qwerty keyboard, SD card, CF card, USB host and slave, mic in, headphone out. On this device I can; * Play a video encoded in Xvid at 1400kbps, 800x480, 25fps with and audio track of 256Khz MP3 or AC3 sound. * I can browse with Pocket IE5 or Picsel Browser (Opera Mobile will be working on it soon and is supposed to be very fast). I have flash7 on it. * I use Qmail3 (full pop3/imap including secure mail and html), * I have a word processor, spreadsheet, database and presentation software * I have a full set of PIM apps that look like the full outlook versions * I can use Wi-fi, bluetooth, GPS, 10/100 etc..etc... * Other software I have:- realplayer, skype, claculator (good one), voice recorder, SMS software, sync mobile's phonebook, Messenger and there is lots I can't remember at the moment, Remote desktop Protocol. Lastly though - It is instant on, stable, 5-6hrs battery life (4hrs on wi-fi), partially transflective screen, the browser will run flash7. The Sig3 was sold untill 2003 (IIRC) so I puts things a little more in perspective as to where our hardware is. Now the above isn't a dig at Risc OS it is just an example of the hard fact that in a lot of ways RISC OS has a lot of areas where even PDA's (HPC's) are a lot further ahead. Now there are some advantages to RISC OS as well desktop publishing apps, photo editing apps, art apps etc. where the software is actually of desktop quality and very good indeed but a mobile device these days for most users has to combine PIM, media and internet duties and in a lot of cases GPS as well as anything else it does. The market would also be limited as I doubt this will bring any new users to Risc OS who would want to buy software it will really only sell to current users and maybe people recently out of the market who were waiting on such a device. There are even a good number of other strongarm based Handheld PC's (as the clamshell CE PDA's were called) that have flashrom and can have the rom re-flashed by the user and would be a great device for a port. NEC 900C, Smartbook G138 (7" 800x480). I think the big opertunity Risc OS had (and I think the Xbox and Playstation3 and other consoles have also really missed out on) Is the humble old cheap home computer market. How many RISC OS based set top boxes were sold? I belive it was in the millions. They were basically computers and with the addition of some small extra hardware (network port, keyboard/mouse and an HDD) would have made a super replacement for the market that the amiga, bbc etc, used to fill (and as people were buying the set top box anyway would buy it for the set-top box abilities). people are building media PC's now (still the problem is it's a software OS, It crashes and has slow boot times - well for a consumer device that sits below a TV it does). So if Castle gets to the time when it can use and release this media playing work they did then would the next Risc OS computer not maybe take the form of some sort of Home theatre media player? Surely the market here is still large and it's not a market where people are pre-disposed to wanting an OS by microsoft. But if the mediaplayer happened to come with the ability to do some browsing and install some software as standard it could bring people intrested in buying software to the Risc OS market who otherwise would know nothing about it and wouldn't even give it a go otherwise? So basically a media player that would handle video, music, have a DVD slot etc. with a nice front end but with the ability to access an OS desktop to use some basic office/internet software (and maybe even an RDP front end so customers can remote their PC from the telly - got to add features that will make it sell and diffrent from the competition and the RDP ability would surely be a good selling point). Now castle are in the set top box market so if they could make the next generation development hardware and consumer hardware a development of a set-top box type arrangement I am sure it would keep the manufacturing costs down due to the volume of boards made in the STB/media player market. Ok so expandability is limited but a USB port should take care of the ability for at least some future expansion. Not sure if anyone else thinks the same but I think Castle are really the only global player with the STB work they have done and if that is what they make and specialise in then I can see it as the only route left to get Risc OS into a large number of homes with hardware Castle is comfortable with. It's also the only market I can see where the majority of people don't have this kind of device yet but I think most people will so there is still a large market to play for. Now if the media player works and increases the market it would make a Risc OS laptop/PDA type devices and new and better software a viable project as there would be a number of people intrested in taking the same desktop as the media player came with out and about with them (even if there are a few holes in the software portfolio though hopefully they would quickly be filled if there was a market - I bet oregano 3 would be back on the cards and appear very quickly). I can't see another route here at all. Every other route I can see is really only going to sell to current Risc OS users and pretty much nobody else and what we need is a route to get hardware into a large number of homes to actually grow and improve. either that or we need a really really bad virus that actually wipes millions of peoples data and renders loads of PC's unworkable for an extended period of time causing companies and people to eveluate what they need from a PC ok so that's just wishfull thinking. In reply to recent comments about the lack of a media player and Cineroma in particular, I don't think the problem was ever lack of resources. It was being demonstrated by Steve Potts at Wakefield in 2006, and it would massively increase the number of file formats we can play on RISC OS machines if it was ever released. However, the author has not been contactable by email for a good two years, there have been no progress reports and no announcements as to when it will be released. The handful of people who have copies cannot pass them on without the author's explicit authority and there is no way of contacting him. I'd be quite happy to pay £30-40 for this product as is, but it seems I will never get the chance. PERSONALLY I doubt whether the author has ever intended to release Cineroma for RISC OS, and the expectation that he would has made things even worse by discouraging other programmers from developing video players as well. As somebody who has wasted a fair bit of time trying to get permission to get a copy of this application for the last remaining schools that use RISC OS, if you're out there somewhere, Mr McEwan, reading this, please prove me WRONG !!!!!!!!!!!!!!! I think the original article is bang on. If there is any real reason to buy a RISC OS computer in 2008, it would be as a super-lightweight, low-resource, cool & silent laptop. That's the only remaining niche for general-purpose ARM computers. I'd buy one. The problems of Flash/Real/Quicktime etc. playback are real, but soluble. I'm typing on a Linux machine & I have full media playback, including Quicktime. I have an official Flash client, but there is a Free one too, and Free video codecs are widespread and high quality. The Unix Porting Project could have been RISC OS' salvation here, but it didn't attract enough interest or support. Instead, developers are wasting their time on multiple MSN clients and so on. However, the opportunity is past, now, I think. The OLPC project's XO-1 "$100 laptop" shows that X86 has effectively moved into and taken over the low-power high-efficiency niche. Meanwhile, in the commercial arena, there's Asus' EEE PC, a £200 laptop with an Intel ultra-low-voltage Celeron in it. Solid-state storage - Xandros Linux booting from a 2GB Flash drive. Onboard USB2, 802.11G WLAN, Fast Ethernet, 56K modem. What more do you need? It's a complete, low-power, cool-running, near-totally solid-state PC, it's cheap and small and light. It's derived from the Intel Classmate PC, Intel's effort to kill off the AMD-powered OLPC. And it's completely Microsoft-free, immune from viruses and spyware, yet entirely file and content compatible. The Acorn RISC machines succeeded because they were fast, powerful, simple and cheap. Their successor models didn't succeed: they only sold in paltry numbers to fans. Now, they're slow, limited, woefully underpowered and horribly expensive. The OS has a pleasantly clean GUI and some small fast apps, but it's not very stable or reliable and it is extremely feature-poor. The user interface of Mac OS X is much more polished and powerful, both attractive and pleasant to use, and it too has a wealth of simple, elegant, powerful apps. I'm afraid the RISC OS producers squandered their chance, wasting their time arguing and fighting. Castle seems to have done the best it could do with limited resources; I'm impressed with its efforts. RISC OS Ltd has just spent years on tweaking and fiddling and squabbling with Castle and Pace, as far as I can see. It's a common problem. The Amiga world did the exact same thing; arguably, so did the BSD world, fragmenting into FreeBSD and OpenBSD and NetBSD and DragonflyBSD, while the Linux and GNU people just mucked in and got on with it. Of course, on Linux, there's the fighting between KDE and GNOME. It seems to be human nature to contest for limited resources. The GPL helps, though. It is what has prevented Linux fragmenting, when BSD's license almost encourages it. I note that ROOL is not actually Free or open source and is not GPL. I therefore don't see much chance for it, either. Yes, I'm afraid I agree with all of this. Despite taking hundreds of pounds from users, I just can't see what the Select project has really done to take RISC OS forward. I'm sorry if this offends people, but having recently switched from the A9's OS to 4.03 on VRPC, there are only a couple of things I notice. There may be stability fixes, and some of the bundled apps have nice updates, but the fundamentals haven't been fixed. If I had been a Select subscriber for the life of the project, I'd be livid (and poor). I hope that ROOL does at least offer some hope. Despite the forums being quiet, I know there is work going on (I'm involved with one project in a minor way). If at some point in 2008, it proved possible to build the entire OS, with some nice extra features, then at least it would offer a way to make a new RISC OS machine cheaper. For example, could VRPC sell for a lower price, if they didn't have to licence RISC OS Adjust? Would the politics allow it? As for ARM-based platforms, it's so disappointing that Castle, having done the really hard work of getting RISC OS to run on non-IOMD and VIDC hardware, now seems unwilling or unable to produce an Iyonix II with a faster CPU. I realise it wouldn't catch-up with Intel, but I would imagine many Acorn-nuts would pay for a relatively fast ARM-based solution. My impression is that plenty more juice could have been squeezed out of the graphics cards on the Iyonix, if only the development time were available. Now it seems like the potential of the platform is destined to languish unfulfilled. Castle have said they are always interested IIRC but Druck reckons they need a processor 3x as fast to justify it. I'm not sure why he says one doesn't exist. In any case, from what can be gathered it seems the Iyonix has significant potential in itself given there are hardware video format decoders and the possibility of 2nd processors. Besides which, has the graphics acceleration really been stretched yet? Only Quake 2 AFAIK has been said to require it. AW: because there isn't one yet. The IOP342 detailed here [link] isn't 3x faster on single core performance (what counts on RISC OS barring miracles) and neither is any ARM11 based chip. Its getting closer, but all the time x86 performance is increasing at a far faster rate, and hence the speed of emulation. If Castle brought out a brand new ARM based machine, and the Virtual Acorn stand set up next door, lining up a whole range of Windows and Mac desktop and laptop machines running VRPC faster for less money, how many do you think Castle will sell? There's a few people still stupid enough to buy one, I'm probably one of them, but it would never make any money and finish off Castle for good. For native hardware to make sense, we need the same sort of leap in performance that the StrongARM offered over the ARM7. There is a very tiny chance that could happen if low power x86 cores start seriously eroding ARMs core market, but I don't think its a realistic possibility that either x86 will do this or ARM partners would respond in that way. It's not Druck that reckons Castle need a faster processor but Castle themselves. I remember Jack Lillingstone making a comment to this effect at one of the shows. "If the IOP342 contains all the peripheral features of the current chip, which it seems to, then only there would only need to be a redisgn for the differing package layout, plus of course any other changes such as an updated southbridge which would be needed. The seperate flash to hold the ROM could be deleted as it has 32MB on board. The 1.2GHz clock speed increment combined with the Level 2 (undoubtedly only 512K) would give a substantial speed boost over the IOP321. The 1MB of internal memory could be used to hold critical parts of the OS for further performance gains. This just may hit the 3x tipping point for Castle to consider an Iyonix Mk2." Druck no doubt knows what he's talking about, and I agree that an updated Iyonix would be great. But I suspect technical problems aren't the issue: it's economics. Even if a much faster Iyonix was released along these lines, Castle would struggle to sell enough to recoup their development costs. It's a dreadful shame, as the move to an Iyonix Mk II would surely be much less effort than the original project was. As I often say, I'd love to be proved wrong! Druck - if you're interested in an independent hardware platform and a supporter or enthusiast of RISC OS then buying a genuine RISC OS computer is exactly the opposite of 'stupid'. AW: Except the hardware we have isn't primarily designed for RISC OS. The Iyonix is a distinct, independent computer that runs RISC OS. It is *not* a "shame", nor is it stupid to buy it or support it. George Greenfield: "'questionable decision': that depends entirely on what the Mac, Linux or Windows user wants to do, surely?" Well, that's what one would question, isn't it? Probably something along the lines of "Are you sure you don't want to...", followed by a very long list of commonly used features of the other platforms that aren't available on RISC OS. In your case, the important items on the list would be "use it on the move" and "access Flash-intensive websites", presumably. Don't get me wrong, I still use my RPC for e-mail, usenet, and a few other things, but that's mostly because I always have. I also use it for browsing a small set of websites, but mostly I use something on the PC for that, nowadays, so I can watch video clips, etc. I don't see why still seriously considering to buy a RISC OS machine is 'stupid' or something to that effect. I can name a personal example, a situation which no other platform can yet substitute including VRPC or RPCemu. I am, and will keep, using RISC OS as the main computer platform in my humble little studio. There's a very simple reason why; it assists the creative flow in the most inconspicuous manner. I know it's not technically the smartest choice, far from it. But as most artists can probably attest to, having the most advanced equipment in the world becomes useless when it obstructs the creative flow. Since VRPC or RPCemu doesn't integrate with the hosts' MIDI system as far as I know, I remain with native RISC OS hardware. For all other things, I use Mac OS X. This is why I can understand that some people still choose to employ native RISC OS hardware over the cheaper, faster and technically more advanced alternatives. Other people just don't want to run RISC OS inside a PC or Mac, because they would still need to maintain the host platform. The reason why people choose something other than the norm, or the usual, is because they want to be able to do something differently. Typically in a manner that 'feels' more natural or at least less cumbersome. The problem I see with many people, is that they have come to focus on hardware and dry technical specs to tell them how 'good' something is. From computers to digital cameras to all manner of electronic equipment. I think most active RISC OS users can explain very well why they choose RISC OS, in spite of all its shortcomings. Where exactly is the difference between what people expect a computer should be able to do nowadays and what people choose to do with a computer nowadays? AW: Where do you get this stuff from? 10 years ago, I argued that RISC OS needed to focus on small portable devices, but I think it is too late now -- other solutions are now sufficiently advanced that there is no definite advantage to using RISC OS. RISC OS might have been useful in an OLPC-like initiative, but that is also too late now. So, I can't really see RISC OS ever becoming mainstream. At best, it will live on for a while as an enthusiast minority system, or various parts of it (such as the font system) might migrate to other platforms. Or it could have a use as an embedded OS (used in GPS navigators, MP3 players, HD recorders, or other specialised systems). The trouble is there are no compelling reasons to use RISC OS in embedded systems these days as rjek has described. Even for fonts, although I still think the RISC OS rendering system is superior, the various anti-aliased true type engines and even MS's Clear type have matured sufficiently that there would be little gain from anyone licensing our font manager. I'm now browsing on a hen's tooth, also known as a 4GB eee PC, and its fantastic. Its got full version of Firefox with plug-ins and video codecs, and runs like a dream, I'm afraid to say its a far better experience than any RISC OS browser even on the small screen. Given there isn't any ARM processor as powerful as this underclocked Celeron, I don't how any RISC OS based device could compete, especially not with the price point the eee sells for (even considering I paid a bit more to get hold of one this century). Page generated in 0.6379 seconds.